Demeter was the goddess of corn, grain and harvest. Her name meant “doorway of the mysterious feminine.” Demeter was responsible for all the crops that grew on the fertile lands of the Earth. She had a beautiful daughter named Core who she loved dearly with all her heart. 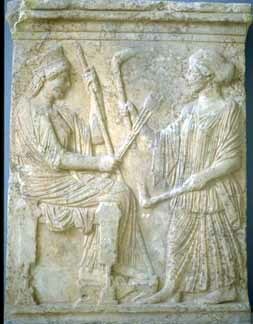 As a matter of fact, Demeter tried to spend as much time with her daughter as possible. Demeter raised Core on Mount Olympus and they lived happily together along with the rest of the family. During the ancient Greek times, there came a period of a perfect climate followed by healthy crops, green trees, blooming flowers, and happy people. 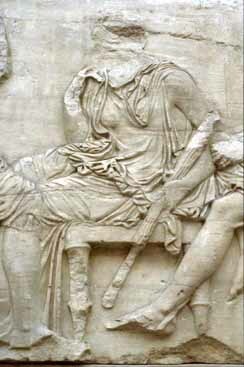 Everybody was very thankful to Demeter for blessing them with such a great land. Demeter was also very glad because she had pleased her people and she had been enjoying her life with her daughter, Core. 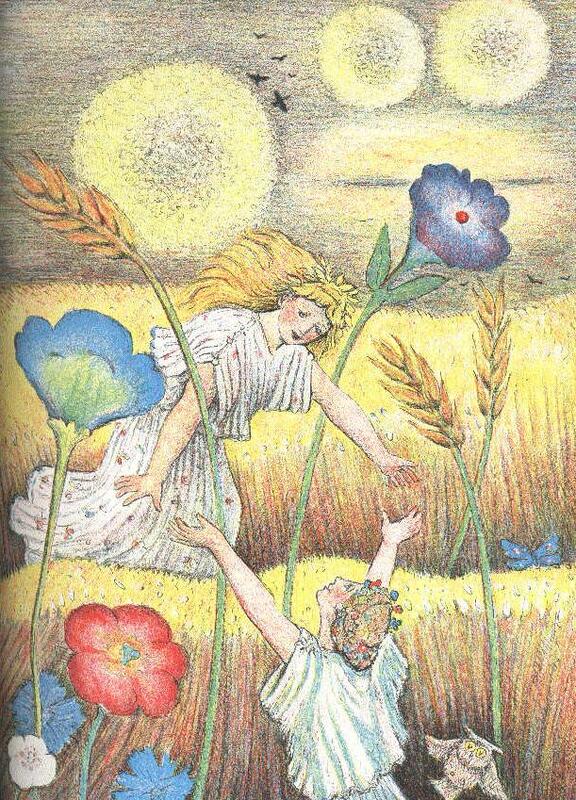 One sunny day, Demeter and Core were picking flowers in a field. Hades spotted the beautiful daughter and admired her good looks. Eros, the daughter of Aphrodite and the god of love, came flying about. He saw Hades look at Core, smiled to himself, and decided to have some fun. So he aimed the arrow at Hades and took one good accurate shot. The moment the arrow pricked Hades he fell madly in love with Core and decided to make her his wife and queen of the underworld. Core had wandered off somewhere, o as she bent down to pick up a flower, the land next to her divided and out came Hades. He was riding on a chariot drawn by a couple of horses. He grabbed the terrified Core and they dived into the world of Hades, the underworld. Core screamed out to her mother, but it was too late. The Earth had already closed up. Demeter heard only a small cry and she sensed trouble. She looked all over the field for her daughter but of course there was no sign of her. Finally, she asked Apollo, the god of the sun, who had kidnapped her daughter? Since Apollo was always watching over Greece he knew pretty much everything that was going on. He answered her with the truth and said that Hades had taken her away, but there was one bit of information he had added. He said “But her name is not Core any longer, Demeter, it is Persephone, for she is no longer a maiden but the bride of Hades.” When Demeter heard this she went crazy and as she grieved all of nature grieved with her. The trees lost their leaves, the flowers wilted and the crops dried out. She was so mad that she left Mount Olympus and walked around among the mortals on Earth dressed as an old woman. Nobody recognized her. 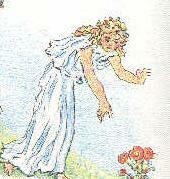 For one whole year, Demeter refused to let anything grow on the surface of the Earth. All the pleasing greenery turned into dreadful brown dry land. The people of Greece were starving and no one could do anything about it. All of the gods were very worried about these people and they begged Zeus to talk to Demeter. “You know how Hades is…” he said to her, but that was not enough. She refused to let anything grow. Zeus knew he had to do something so he sent Hermes down to the underworld in order to persuade Hades to let Persephone go. Hades had managed to get Persephone to eat from a pomegranate, the food of the dead. He accepted to allow Persephone to leave but he knew that she would be back for she had tasted to food of the dead. When Demeter and Persephone were reunited, Demeter was so happy! They wept tears of joy, and Persephone told her mother all about her horrible experience with Hades, and the gloomy atmosphere of the underworld. She also said that the only food she put in her mouth was one seed of a pomegranate. Zeus knew all about this, and felt very sorry for the both of them. In order to make everything fair, he decided that Persephone would only spend six months of the year with Hades in the underworld, and the other six months would be spent up on the surface of the Earth with her mother and family. This is the story of Demeter and Persephone and this is how the seasons came to be. During the six months that Persephone spent underground, Demeter would not allow the Earth to blossom (winter and autumn), but during the other six months, the plants grew and the trees were covered with leaves and everyone was happy (summer and spring). The symbol of Demeter is corn. Ceres was the Roman god of grain and harvest from whom we derive the name cereal.